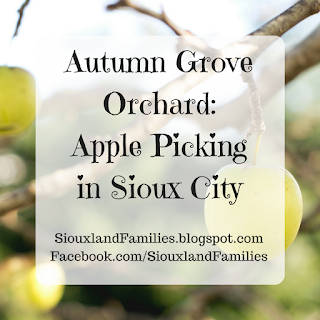 It's officially apple picking season in Sioux City!! Autumn Grove Orchard just announced that they are opening for the season on Labor Day, which is Monday, September 3rd, from noon to 4pm and that they should have Macintosh, Gala, and Honeycrisp apples ready! Autumn Grove Orchard is a pick-your-own apple orchard at 1658 180th Street, which is just a few minutes east of the Southern Hills Mall and Lakeport Commons, with 9 varieties of apples available to pick throughout the fall. They also offer honey from a local beekeeper, and a variety of baked goods and crafts for sale, and even some pumpkins near the end of the season. They will be tentatively be open on weekends in September and October, or until they're out of apples, from noon-4pm, rain or shine, unless there is lightning or otherwise actually dangerous weather. Always check their Facebook page before heading out though, because nature is unpredictable! Depending on the weather, there could be many varieties ripe some weeks and hardly any other weeks, and longer or shorter hours and/or a longer or season for them could be the result. While they can't control the weather, they do keep their Facebook page well updated, so I definitely recommend checking it before planning a trip to the Orchard. My kids and I went to Autumn Grove Orchard a few years ago (they opened in 2013), and I can't wait to come back sometime and see how much it has grown. Basically there are rows and rows of apple trees, and you pay and then walk around and gather your apples! It is very kid friendly, and most of the rows are stroller and wheelchair accessible, but it is grass and dirt, not paved, and a few of the rows are on enough of a slope that they would not be easy to navigate with a stroller. If it is important to you to access every row, I recommend babywearing, or having kids walk if they are able. Or you could definitely contact the owners to make sure a variety of apple on flatter rows is available if you will have a wheelchair with you! In my experience they are very responsive, polite, and helpful, and will definitely help you find a time and date that will work for your family. One of the really fun things about Autumn Grove Orchard is that many of their trees have apples at a height that is easy for kids to pick them off themselves. I also loved how clean it was. I had expected lots of rotting apples around the bases and then flies and wasps eating them, and there was none of that. They kept it cleared so well! Like any pick-your-own orchard, you do need to anticipate the apples might be more "ugly" than grocery store apples. When we went, we didn't see any rot, but there were lots of dimples on some of our apples, which aren't a problem at all for food safety, flavor, or texture, but could be surprising if it's your first time picking your own apples. The owners are really nice and if you have questions about which apples are good, don't be afraid to ask. Their apples have amazing flavor, and I recommend them for snacking and/or pie. When my family went before, we got several varieties and my kids thought it was really fun trying slices of different types and noticing how different types of apples vary in sweetness and tartness and how crisp or mealy they are.